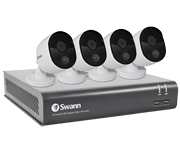 Enjoy crystal clear footage with this Super HD four camera CCTV kit by Swann with 3 megapixel recording (1.5 x clearer than HD 1080p) and True Detect thermal-sensing cameras. Hybrid DVR with 2TB capacity hard drive. Super HD 3 Megapixel recording and playback. 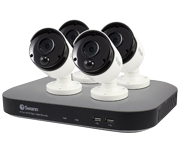 Includes 4 x PRO-3MPMSB heat sensing cameras. 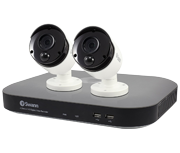 8 channel system can expand up to 8 cameras.